Guess which one is the American coffee cup! I'm almost embarrassed to show you this photo....do we Americans super-size everything? The French drink coffee in small cups...the white one. The mug is my favorite, and I brought it with me when I moved to France. It's my morning coffee cup, but I'll admit that I fill about a quarter of it with hot, frothy milk,. On Wednesdays after exercise class, Christiane, Marie-Yvonne, and I stop for a coffee at Le President. They almost always have two little cups apiece. Wouldn't it just be easier to have one big cup?? Delicious!!!! I love a big mug. Well, teacups are pretty too, but for morning coffee, bigger is definitely better IMH(American)O :D. It's also fun to see people's favorite mugs. Love the photo! I rather like to have two small cups. Something fun about going back for seconds, and some days, a large mug is just too much. 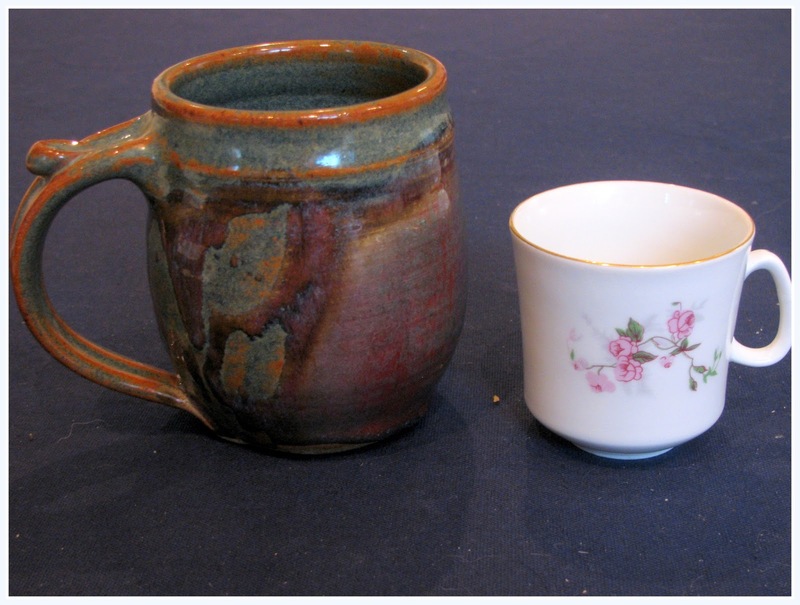 Your mug is more aesthetically pleasing though; the porcelain cup, though delicate, is more run-of-the-mill.